Welcome back to campus and back to the Wesleyan Film Series! The annual Ring Family Israeli Film Series starts this Wednesday, so be sure to catch our screening of “Shelter.” Come back on Thursday for J-Lo’s iconic performance as Latina legend and superstar singer “Selena.” On Friday we have one of 2018’s greatest cinematic triumphs, “The Favourite,” and on Saturday we’re giving you the best musical the movies have to offer with the 1952 masterpiece “Singin’ in the Rain”—a must for film- and fun-lovers everywhere! Happy viewing! Israel. Dir: Eran Riklis. With Neta Riskin, Golshifteh Farahani. 92 min. Wednesday, Feb. 6. 8 p.m. Free. The Ring Family Israeli Film Festival continues this week with the newest work from director Eran Riklis. Two women, a Lebanese informer recovering from plastic surgery and a Mossad agent charged with her protection, share close quarters in a safe house. As the women get to know each other over the course of their two weeks in confinement, they form an unexpected bond. Part spy-thriller, part psychological drama, this Israeli neo-noir is filled with suspense and surprises. USA. Dir: Gregory Nava. With Jennifer Lopez. 127 min. Thursday, Feb. 7. 8 p.m. Free. This biographical drama tells the true story of Selena Quintanilla, a Grammy award winning Tejano music icon, as she makes a name for herself and becomes a star. Follow all of her big moments as she gains popularity, falls for her guitarist, plays to a sellout crowd at the Astrodome, and begins to record her first album in English before her rise to fame is cut short by tragedy. Jennifer Lopez finds her breakout role playing the titular character in this musical tale. See it in 35mm on the big screen this Thursday! Ireland/UK/USA. Dir: Yorgos Lanthimos. With Olivia Coleman, Emma Stone, Rachel Weisz. 120 min. Friday, Feb. 8. 8 p.m. $5. Yorgos Lanthimos’ seventh feature film, “The Favourite,” is making a major impression on critics and audiences around the world and is by far the director’s greatest success to date. Nominated for 10 Academy Awards, the piece has stormed all the premiere award ceremonies this year, with nominations for the film’s leading ladies as well as Lanthimos himself. You’ll want to catch this film while you can! “The Favourite” showcases the tumultuous relationships between three women in 18th Century England. Lanthimos knots and unwinds a story of lust, power, and competition as he follows two cunning women’s devious exploits to win the affection of Queen Anne. Lady Marlborough, played by a fierce and enchanting Rachel Weisz, has known the Queen since childhood. The two women are longtime friends and share a bond so deep that nothing can come between them. Or so it seems, until a spunky and ambitious young woman named Abigail (played by the ever-entertaining Academy Award winner Emma Stone) arrives and threatens Lady Marlborough’s position as Queen Anne’s nearest and dearest. It’s beautifully shot by Irish cinematographer Robbie Ryan and lusciously designed by Fiona Crombie. It’s essential to view this Oscar darling on as big a screen as possible—and lucky for you, we’ve got that covered! USA. 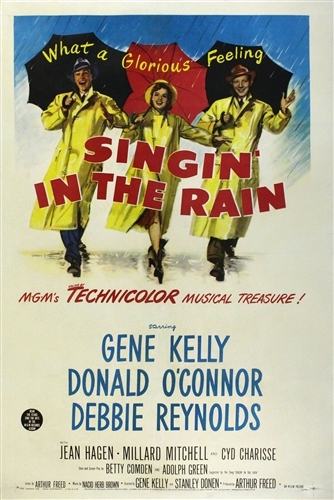 Dir: Gene Kelly, Stanley Donen. With Debbie Reynolds. 103 min. Saturday, Feb. 9. 8 p.m. Free. The crème de la crème. The best of the best. The definitive feel-good hit of 1950s Hollywood technicolor pictures. THE movie musical. Pregame your Saturday night with the ineffably charming trio—Gene Kelly, Debbie Reynolds, and Donald O’Connor—and watch them sing and dance to their hearts’ content. This joyful romp takes place in 1927 Hollywood, when the major motion picture studios were struggling to make the transition from silent to sound film. Many jokes and gags ensue as our three leads try to revamp an unsellable silent period piece starring Don Lockwood (Gene Kelly) and his annoying on-screen love partner Lina Lamont (Jean Hagen) for a modern audience. Laugh and smile as these stars update the film-within-the-film with musical numbers for the Roaring Twenties that will keep you smiling through to next week. So, make sure you catch this dazzling classic Technicolor film on the big screen. Get your Wellington boots and umbrellas ready for a real splash! Beatrix Herriott O’Gorman and Julia Levine can be reached at bherriottogo@wesleyan.edu and jlevine@wesleyan.edu.